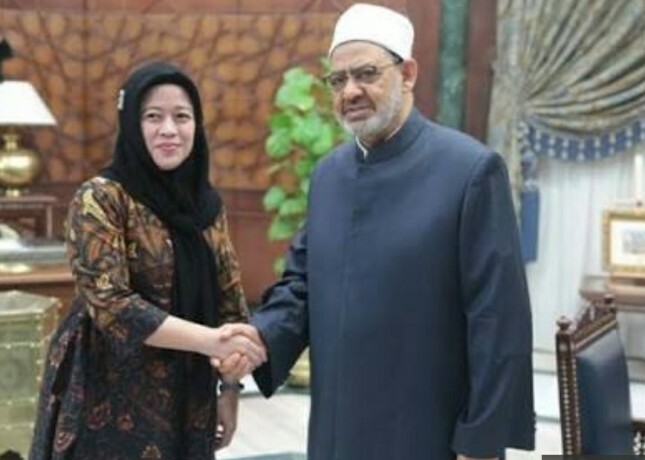 INDUSTRY.co.id - Jakarta - Coordinating Minister for Human Development and Culture (Menko PMK) Puan Maharani met Grand Sheikh Al Azhar, Prof. Dr. Ahmad Mohamed Tayeb, in Cairo, Egypt on Thursday (26/4/2018), discussed curriculum development and education for prospective dai. "We need to develop a moderate Islamic curriculum in Indonesia, starting from elementary school to university, Al Azhar University can play an active role in the development of the curriculum," Puan Maharani was quoted as saying in a press release received by media crew in Jakarta on Friday (27 / 4/2018). The development of a moderate Islamic curriculum also aims to minimize the development of radical Islamic thought. On that occasion, Coordinating Minister for People's Welfare also expressed his gratitude for Al Azhar's role in creating alumni who became Islamic figures in Indonesia, as well as Al Azhar's commitment to send teachers to teach dai as well as provide scholarships for Ustadz teachers in Indonesia. Currently, there are about 4,600 Indonesian students studying at Al Azhar. Meanwhile, Grand Sheikh Al Azhar hopes students who do not get scholarships from Al Azhar can get scholarships from the government. "It is important to monitor students not to be affected by groups that are not clear, considering there are about 607 Al Azhar students living in Al Azhar's outer dormitories," said Grand Sheikh. Grand Sheikh also expressed his concern to Indonesian students not to be influenced by groups that are not clear. Al Azhar also expressed readiness to supervise new schools in Indonesia. As a follow up of the cooperation, Grand Sheikh will discuss details with Ambassador RI to Egypt. The Coordinating Minister for Political and Security Affairs also invited Al Azhar to contribute to the idea of ​​establishing the International Islamic University of Indonesia (UIII) as the development of Moderate Islam. This idea was welcomed by Al Azhar who is ready to send lecturers to teach in UIII. "Insha Allah, Al Azhar is ready to send lecturers to teach in UIII to develop fast, very happy to meet with Bung Karno's family," said Grand Sheikh. In addition, the Minister of Foreign Affairs also conveyed his greetings from the President of Indonesia, Joko Widodo, while expressing his gratitude for the willingness of Grand Sheikh Al-Azhar to attend the High Level Consultation of World Muslim Scholars on Wasatiyat al-Islam (HLC-WMS) forum in Bogor May 1-3, 2018 as the keynote speaker.